The other day I made goat cheese and veggie pizza. I love cheese and making pizza is a fun stress free cooking activity Leilani and I could do together so I put them together. spread the pizza sauce add a few crumbs of goat cheese, then the shredded cheese, vegetablesore goat cheese and bake for ten to fifteen minutes! 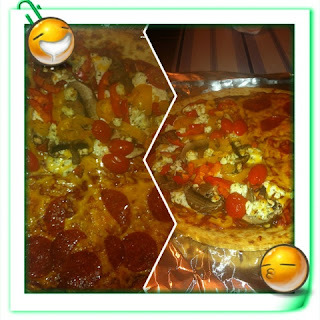 As you can see in the photo I made it half goat cheese and veggie and half pepperoni for Leilani. What's your favorite and stress free meal to cool with your kids?